Amazon Price: $209.99 $209.99 (as of – Details). Product prices and availability are accurate as of the date/time indicated and are subject to change. Any price and availability information displayed on the Amazon site at the time of purchase will apply to the purchase of this product. The Outdoor Tuff Stinger 4 Two-Person Sport Kayak is portable and durable, making it perfect for any water sport enthusiast. Gliding through the water on this kayak is the perfect way to unwind and take in the scenery with a friend. At only 36-pounds, this kayak is designed to be lightweight and ultra-portable, making it easy to transport and store in the included backpack. The (3) high-quality reinforced air chambers inflate in minutes with the included foot pump and have the rigidity and stability of a traditional kayak. Included are (2) 87-inch lightweight rotatable paddles and (2) fins that give the control and stability that you need to have a fun day exploring your favorite waterway. (2) removable HD inflatable fabric seats and (2) nylon splash covers will keep you comfortable and dry all day on the water. Inflated dimensions are 12-feet 4-inches by 30-inches by 13.5-inches (LxWxD). Total weight capacity is 425-pounds. 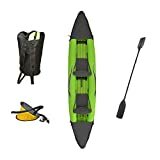 The Outdoor Tuff Stinger 4 OTF-4252PK Inflatable Two-Person Sport Kayak comes with a 1 year limited Manufacturer's warranty. BAC Industries is a U.S. and Global manufacturer/distributor of high quality consumer and industrial products. We specialize in manufacturing a wide range of home, garage and shop products for consumers and professionals.